We have received some great initial feedback for a relatively new ad placement. Our Blog Alert Sponsorship is a text-based slot prominently displayed in each of our Blog Alert emails. 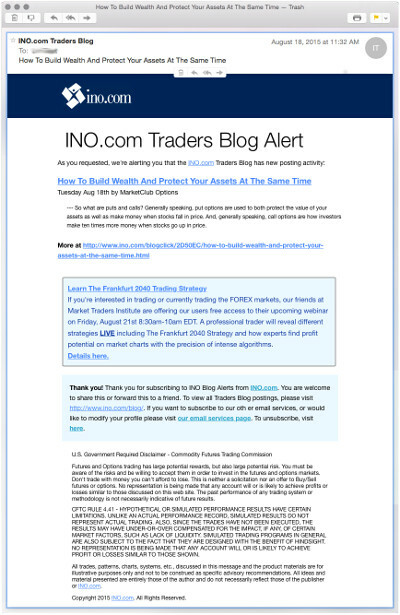 The alerts go out to approximately 66K traders who have requested an email every time we publish a blog post by INO.com founder, Adam Hewison, or any of our other distinguished traders and contributors. As multiple alerts could be sent in a single day, this placement is priced on a cost-per-click (CPC) basis. Do you think this placement would be good fit for your offer? I’d love to talk with you about this position and discuss how we can help boost traffic and add volume to your lead-gen or sales campaigns.